Always we are trying to spend all our leisure time or vacations THERE – it is in the former East Prussia. Unfortunately, after the last war, these areas have been cut by a boundary, and the post-war propaganda (still being strong despite the political changes in Poland) can not cope with the rich historical heritage of this land. We however went to relax and search for historical gossip. And we found both. And moreover, we found a great place to get true relaxation. We stayed in Galiny. The place is not so far from civilization, yet still far enough – to allow forgetting about everyday busy life. Moreover, a place is full of warmth and cordiality. I saw Galiny for the first time almost two years ago (the time is rushing so much, that it makes me fear) from the coach, when I traveled with my group to Bartoszyce. Then – again, when once more passing by, living a life in motion – without stopping for even a short breath. I love my job, but I definitely do need a holiday from time to time, so… I ordered a room for us in the Palace. (Galiny is a separate subject – so I shall write about is next time). We packed and started off in rainy and gloomy autumn weather. 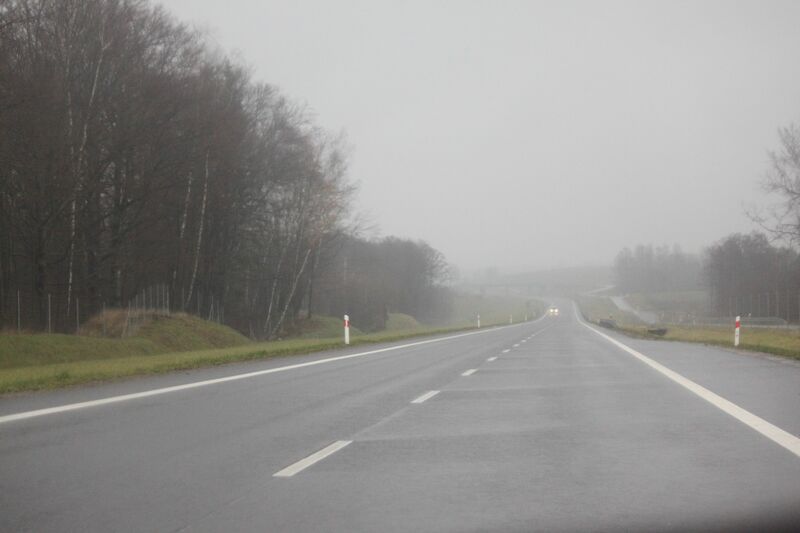 We drove on a part of the famous Berlin-Königsberg highway constructed partially before World War II. Hitler’s demand for the exterritorial highway through Poland – was one of many causes of that dreadful military conflict. 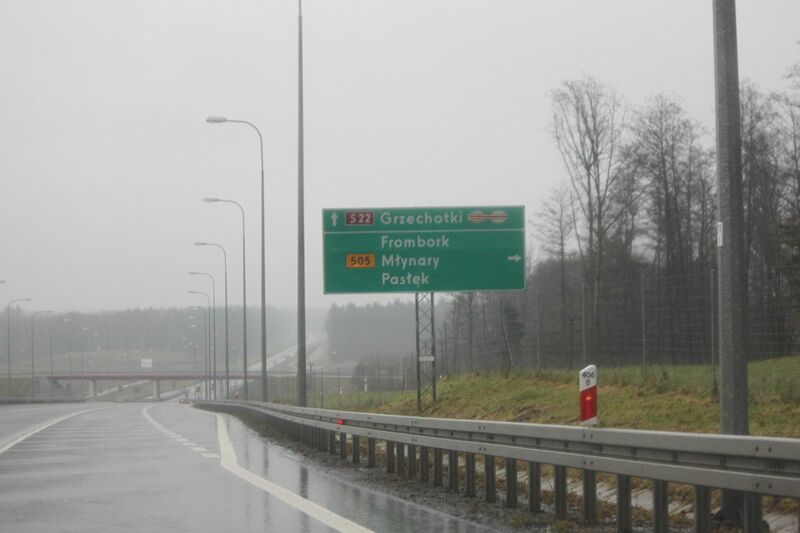 However parts of this highway (within East Prussia and Germany) were completed. Nowadays a great reconstruction and upgrade began. 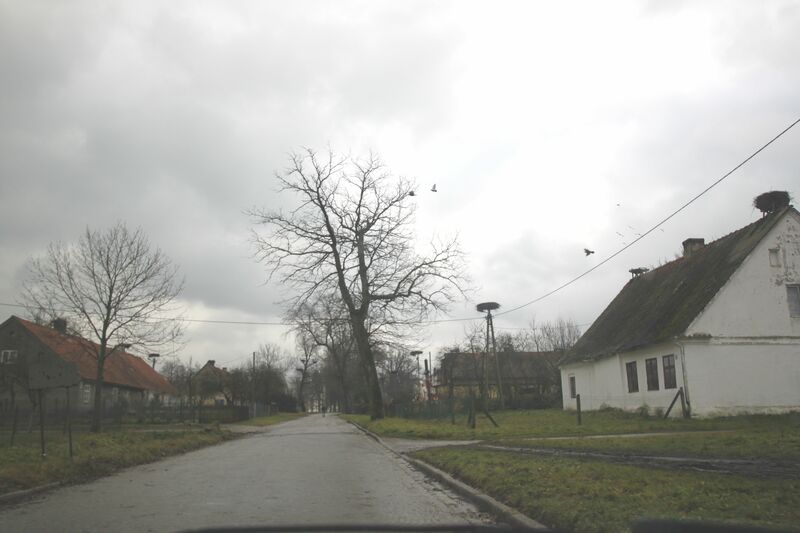 Driving comfort and almost undisturbed emptiness on the road, fortunately did not make us bored when we turned off the main road to Pieniężno, and then to Górowo Iławeckie. I shall write about Górowo separately – and we definitely have to go back and visit the Gas Industry Museum there. But it is not only for the museum… Despite the rain and the approaching dusk, I liked the town very much. It has in it a unique atmosphere of the border town, situated at the world’s end. . Life near this specific border must not be the easiest one, and probably not very town-creative. Besides the tourists are not frequent visitors here… But it looks that unemployment is. So far then, here I am giving only few notes from a wander along the border. 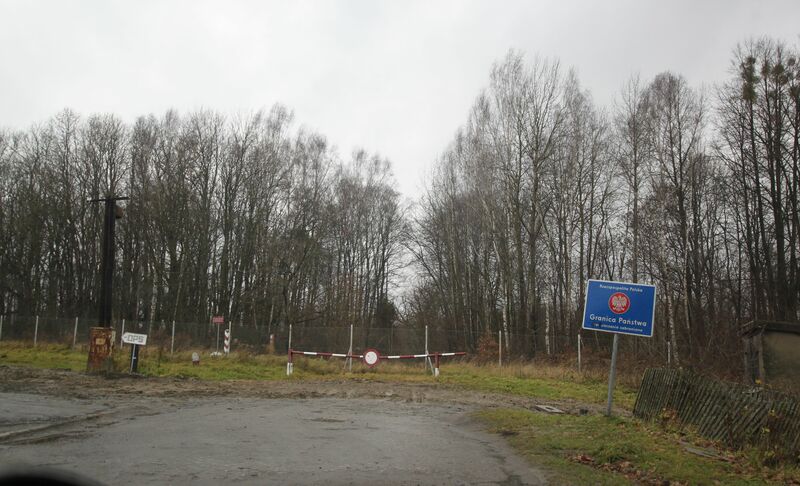 Szczurkowo – border with Russia. Because it was this border between two worlds, that made the deepest impression on me. Never before have I seen this order so closely. I have never been so bold as to come so near it. And now I had an opportunity to see it as well as take photographs of it. I must admit that, like nothing else, it fell in my memory. I wrote that after the war the area of East Prussia was divided by the border – and not just with the land, the political one, but also much worse – the mentality border. The best proof of this is Szczurkowo, where I took the picture above. Until 1945 it was part of a big property. After the war, the border divided the property… The manor was demolished – and on both sides of the border there remained only the wretched remnants of what had flourished for centuries.Szczurkowo (Schönbruch) first appeared in the history of this land as the property of knights in the 14th century. For a long time the property belonged to the knightly family of von Eulenburg-Wicken. Then since 1871 the property became the property of the family von Bolschwing. Their manor house was demolished in the 1960s on the Polish side of the border. The village was one of the largest in the area. According to statistics, in 1939, 1,139 people lived here. The area of the property was 642 ha (1 586,42 acres)After World War II the village was divided by the border. People were displaced, and the traces of village prosperity were erased, and the place was sentenced to oblivion. Could it be because of the name of the past owners??? Here on Oct. 15, 1909, a man called Alfred Otto Albrecht von Bolschwing was born… During the war he served Reichsführer SS Security Service in the rank of SS Hauptsturmführer. He was a very closely associated to Adolf Eichmann, bah! He was his mentor. After the war in the 1950s, he managed to get to the USA. He received the American citizenship in 1959, however, concealing his Nazi history (he joined the Nazi party at age of 23 in 1932).In the United States he worked for the Central Intelligence Agency (CIA). In 1981 – the decision was made for his deportation to Germany… He managed to avoid it, because… he was in hospital due to bad health. However, this did not prevent the case, resulting in depriving him of his U.S. citizenship. At the same time the court order said that he would be repatriated as soon as his health has improved. During the war von Bolschwing was always mentioned along with Eichmann. So now it was clear what turn would the judicial process take back in Europe. … But the Baron escaped justice – in the same year he died. So could it be that the village associated with such a name has been deliberately condemned to oblivion? Today this place is indeed at the end of the world. 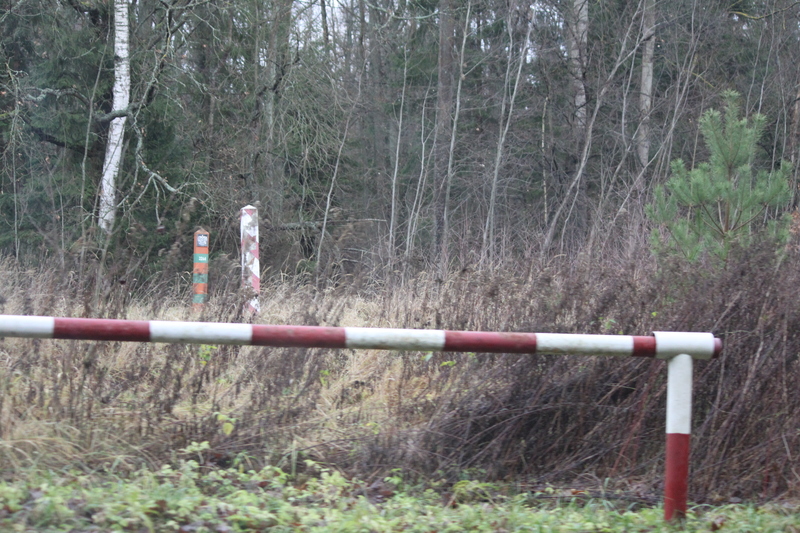 On the Polish side of the border – there are few isolated farm buildings and almost an illegible park as remnants of the former estate. Number of residents and visible negligence all around have nothing to do with the former prosperity and wealth, which had once reigned here. However the efforts to improve the image of the village can be seen. Not everything is dirt and mess. Moreover, people clearly are counting on the attractiveness of the village as one of the so-called stork villages. 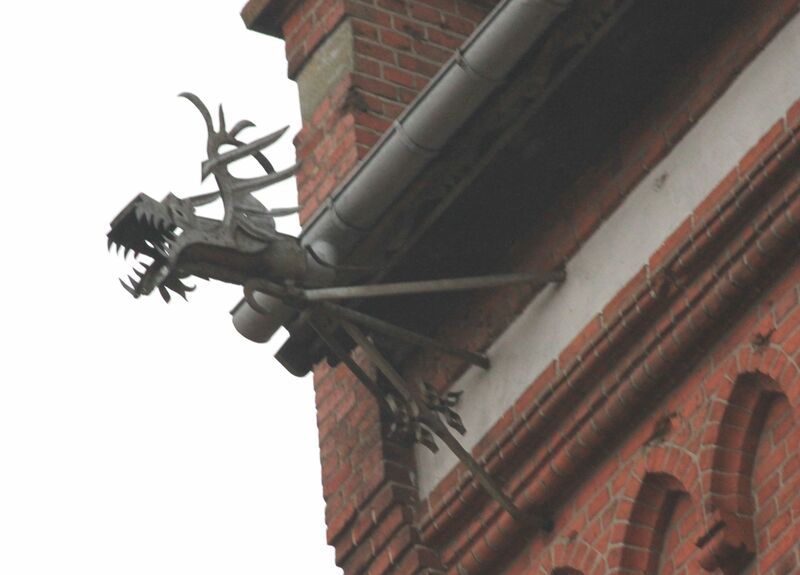 Indeed, there is one of the larger concentration of stork nests, and each was built on a special platform. Especially with the barrier and a fence on the border.